Welcome once again to my weekly spotlight on the blogosphere and my own reading list within! Hobby update 27-2-17 - here comes the vanguard! Greetings all - another week goes by and we've reached the end of February! There will be the usual recap of the month coming but in the meantime lets have a quick look at the week's progress shall we? Ok so this is a bit of an exaggeration, because whilst I've played another three games since the last review, one was unfinished (3 turns in) and another was so ruined tactically by my dice rolling that it hardly constitutes a solid basis for evaluation. There were some points I could glean from it, but not much (don't roll triple one for your attacks when your libby is in a challenge with a powerfist sergeant? Don't roll double 1 on your two hits with your contemptor when facing terminators with chainfists?). This was the Golovin narrative game I reported on the blog a while back, and considering I'd been looking forward to it for quite a long time, the dice abandoning me was extremely disappointing. I started the game with quite a bit of stuff in reserve, two tactical squads, my warlord and the Stormhawk Interceptor. As the two squads were in pods this shouldn't be too much of a problem I thought, but I'd reckoned without the dice. The Stormhawk gave me +1 to my reserves rolls, but I still managed to leave it and the Warlord's squad off the table on turn two. I then failed the roll for the warlord on turn 3 as well. Given how much was in that squad, it really hurt me in the game, nearly 40% of my army not arriving till turn 4 meant that by the time they did get there, my other units had been mopped up. My initial plan had been to bring the warlord in with the first drop pod, but I had my mind changed when I needed to secure an objective within charge range of the enemy terminators on turn 1. I went with using the smaller squad as a bit of a sacrificial unit instead. This factor reinforced my gut feel before the game that two pods doesn't work that well. I've since revised the list to include a third pod (empty) so that the two with guys in them can both arrive on turn 1, and I'm only left with 35pts in reserve. My second learning point from the game was deployment positioning is key - I placed my thunderfire cannon in such a way that the techmarine gunner was holding an objective - annoyingly though that left him out of cover and he got annihilated by plasma fire from the nearby tactical squad. 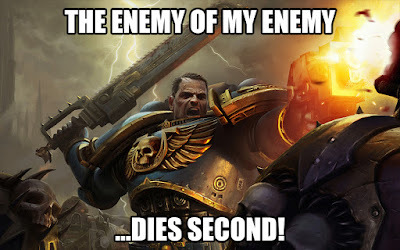 Had I placed the techmarine within the cover, I'd have had a much better chance of keeping him alive and the thunderfire cannon in the game for longer. The third point is fire discipline. By this, I mean really considering what you are trying to achieve each turn and what needs to fire at which unit to achieve it. In trying to hamstring my opponent's mobility by killing their rhinos (which would have saved the techmarine) I decided to fire the thunderfire at one (not really likely to destroy a rhino) and the landspeeders at another. The landspeeders did their job admirably, wrecking the vehicle even without needing to resort to the heavy bolters, but having already fired the thunderfire cannon, I couldn't then use it to target the angry marines who disembarked, and their return fire caused two landspeeders to die and the last to jink. Better fire discipline would have been to concentrate the shooting on a single target, using the speeders to wreck the rhino and the thunderfire to target the passengers as they disembarked. As it is I basically lost both units to a poor tactical decision, and all I achieved for the trouble was wrecking a single rhino. The final learning point is a slightly more esoteric one - and that's that some units are naturally better at holding ground than others. I'm not talking about abilities either - I brought a Contemptor dreadnought with Kheres assault cannon to this game. It has performed really well or been heavily targeted early in all my games before, but this time I used it to hold an objective in my deployment zone when we deployed for the game. The problem is, I then drew that objective card in two successive turns, meaning I was not inclined to move the dread at all. Consequently it was out of range to start with, and then got charged by the aforementioned chainfist wielding terminators. It didn't help that I failed two of my 3+ rolls to hit and both 2+ rolls to wound, but I'd have been better served getting it into the game earlier, and using other units to secure the objective. Banishing the bad dice from the week before, there was also actually not much to learn from this game, but for other reasons! It was another 1000pt game, played against Orks. Not the strongest of codices we already know that (possibly one of the weakest) and one of the problems that causes is it highlights the strong units on the book. By which I mean Lootaz. The weakness of the codex was exacerbated in this instance by the army being 'under construction' by its owner, so it was a bit of a mix of units that don't represent the best options anyway, since it was just what he had access to. As I mentioned above, the list was now tweaked to include a third drop pod, and so the warlord smashed down on turn 1 right in front of the lootaz, whilst my melta squad hit the ground in front of the deff dread. 7 of the 9 lootaz died, and the deff dread exploded, whilst other shooting from the contemptor wrecked the warboss' trukk and the land speeders massacred the squad within, including the warboss himself. To be honest, at that point it was all over bar the posturing, the killa kans made it a little more respectable, taking out the warlord (though they got lucky even so) and a couple of my other units were whittled down due to their positioning after the alpha strike, but it was a comprehensive win with my opponent conceding on turn 3. Sacrificial units can be worthwhile, but it all depends on the damage they cause - in this game it was absolutely worth losing the warlord's unit to take down the lootaz - 9 of them, even hitting on 5's, would have made a complete mess of just about any of my units (possibly not the contemptor) and so getting rid of them early was massively important, even if it meant losing the squad afterwards. Fire discipline. This time I got it right - with the trukk being vulnerable to incoming fire, it was fair to assume the Kheres cannon on the contemptor could take it in one turn - doing so allowed me to save the greater part of my AP4 fire (the warboss and his unit had a 4+ save) for the unit inside, and whilst it took more than one turn, the hail of assault cannon and heavy bolter rounds made sure he wasn't a threat. Ok, the big one - the one army everyone dreads facing. And it would be one of the club's best players wielding them too! 2,500pts on the table (well, not exactly on the table in my case) as well. My opponent is an extremely reasonable man though and whilst he'll happily take filth to tournaments he appreciates that isn't necessarily what people want from a club night game. Only one wraithknight, and one unit each of d-cannon and d-scythe wraithguard, an aspect host (with BS5) of warp spiders, dark reapers and fire dragons, and three units of jetbikes, plus a fire prism etc. Ok, so even a not filthy eldar list is pretty nasty! I took all four drop pods I own, filled one with grav devastators and the other three with veterans, three minimal tactical squads with longer ranged guns, scouts etc. The wraithknight died to the grav devastators, who in turn got smashed by d-cannon wraithguard and fire dragons, who in turn were getting lined up by all sorts. The tactical squads took the brunt of fire from scatterbikes, which in turn lost members and jinked from the landspeeders. The fire prism exploded to a melta squad, and the nearby d-scythe wraithguard (who would have been the target had the pod not scattered so far) duly deleted them in return, before taking a sternguard combi-plasma team to the face, losing most of their numbers. The war walkers outflanked and shot the contemptor in the rear, destroying it, and in turn Pedro Kantor dropped into their faces with a sternguard combi-grav squad, stripping 3 hull points from the squadron and preparing to punch the remainder to death. I think the eldar would probably have won in the end, I was basically swapping drop units for some of his nastier stuff but by the time I left I'd only got vanguard still in reserve and there were a lot of nasty pointy eared things still abroad on the table. In terms of learning points, that game in particular taught me that sniper scouts in camo cloaks can be extremely hard to shift, even for an army like the Eldar with their awesome shooting. After three turns, with stuff shooting at them every turn I still had three guys left, and they were happily plinking away at wraithguard, killing some. Equally, the landspeeders are still impressing me with their damage output, even though they are pretty fragile in return - I can't remember exactly how many jetbikes they took out in one turn of shooting, but it certainly crippled that particular unit quite nicely. Again however I made a rather silly tactical error - on turn one I was so concerned about getting the grav devastators into a good firing position on the wraithknight I forgot to put them in place to claim an objective card I had. I got it the next turn, but that could easily have swayed things at the end of the game - I really need to find a reliable way of making sure I take cards into consideration at all times during my turn! So there you have it - three more games and things learned from each one! Next game is another narrative game against the Alpha Legion - armies are scaled up a bit this time to 1250pts, and with the Alpha Legion having taken the bait in the last match, Chapter Master Regulo is sending Chaplain Ezequiel to exact a price in blood! What is OP? And do we really know it when we see it? Tackling one of the big subjects today - OP stuff (and no, I don't mean out of production). It's a term that gets thrown around a lot, and the thing is, I'm not really sure a lot of people genuinely get what it is or why something might be OP, and they simply use the term to mean something they haven't anticipated facing or don't know how to beat. Greetings all - we're back with another wonderful blog for you all to check out (if you haven't already). This week, we're taking a look at the excellent Cadia's Creed. Greetings all - time flies, or so they say, and it's Monday again, so that means a peek into my inner sanctum at what's on my painting table! Last week you got a peek at some veterans I was working on - and they've once more been at the forefront of the projects on my table, if only because I've got a lot of stuff to do before my next narrative game on the 2nd March. I'm pleased to say I made some great progress on them this week, and in double-quick time (for me at least) I finished two squads of five in seven days (minus the weapons, more on those in a minute). These are the first five sternguard (yes, I know one of them needs his base doing but I only put him on it on Wednesday!) currently armed with grav guns and combi gravs. I really wanted to bring the yellow to the fore with the robed elements of the chapter - after all their chapter master makes quite extensive use of the colour in his scheme. The models are a complete mish mash of stuff I've picked up over the years, so if you're curious as to where something might have come from, ask - though I may not know! So, what about those weapons? Why have I not painted them at the same time? This is why! We all know Sternguard have all the tools to open just about any lock you might care to want to open, and I figured it would be daft to try an build enough models to cover every eventuality I might want to use - so instead I begged, borrowed and traded every combi weapon I could find to build myself a stash of weapons for my elites to wield. These are all being batch painted in one go hence the reason why they're not done at the same time as the veterans themselves. Also veterans, here's a command squad to accompany some of my characters to battle. There is a fifth model to come, however I decided to paint up the apothecary option first, as again I want to use it in March. This was the state of my painting station on Wednesday night, making sure I'd got everything ready for a game on Thursday. There are the two squads you've just seen bottom left, plus another squad of five bottom right, then the five converted scouts from the Storm kit on temporary bases also bottom right, 7 vanguard veterans/honour guard on the paint station itself (two with jump packs - there will be two squads of five eventually, one honour guard and one vanguard with jump packs, but I'm short of 32mm bases at present) and then finally we have half a dozen sniper scouts at the rear of the paint station partially completed. Thankfully these don't all need to be done for March's game, though a scary number of them are earmarked for that date! Thank goodness I've got 10 done and another 6 partly finished. I need to get the snipers and the five jump pack vanguard done next, then the scouts once I get hold of some more bases. So here are the first two vanguard vets, progress underway! Sorry the pics are a bit dark, but if I turn up the brightness then you lost the definition on the Rakarth Flesh parts. Finally, whilst I didn't get as much done this weekend as usual, I did find some time to put in a little work on the first board for the Grim Dark Brotherhood (I know, updates have been thin on the ground, but we are still working away in the background). The board now has all the road sections in place, these will need highlighting and detailing, but at least now work can begin in earnest on the city block pieces, getting them suitably rubble strewn and broken! Greetings all - welcome to the third of my tactical insight articles - this time I'm turning the burning eyed gaze on the space marine scout squad. Much maligned for a long time (by me if no-one else, haha) these guys got a significant boost in the last codex - how has that affected them? Funny friday - this fish can fight! I can assure you, I've been there. Ironically as the Tau player! Greetings all - so I figured it was about time to turn my mind to producing a thought-piece again for the blog, I've done a lot of hobby stuff, a few reviews, even battle reports, but it feels like a while since I wrote something that was just me putting thoughts on paper. 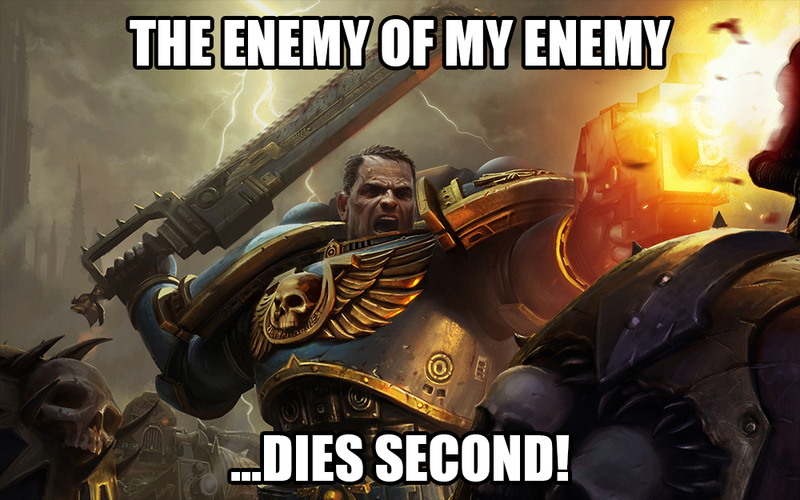 I decided to try and crystallise my thoughts on 8th edition 40k. What will it be like, how do I feel about it, what impact will it have on the hobby and my enjoyment of it? having read another post on St Andrew's Wargaming the other day - I noticed once again some dislike for the concept/use of formations in 40k. I've written before about how the use of formations and detachments is used in terms of constructing an army list, but I refrained at that time from commenting on the principles of formations and detachments over and above the basic rules of using them to make your army list. This isn't the first time I've seen dislike for formations however, and as someone who likes them (a lot if I'm honest) I thought I'd put forward the argument in favour. Greetings all - today we have a look at another blog in a return to my more normal schedule. 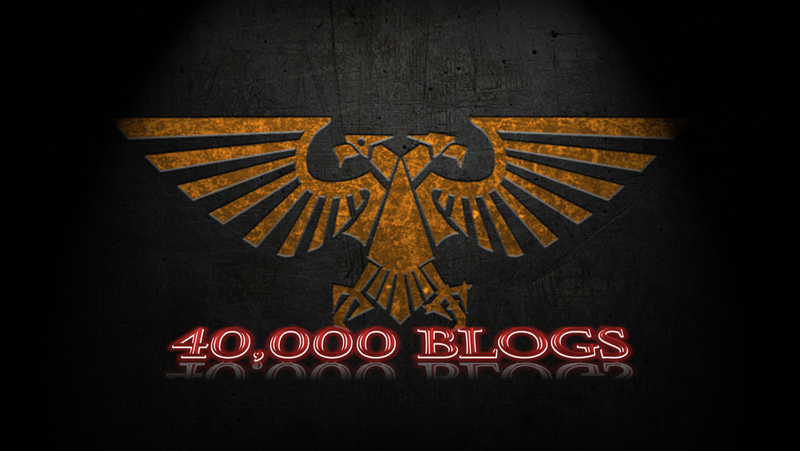 This week's spotlight is on the rather lengthily titled 'A warhammer 30k horus heresy and 40k blog - four dads of the apocalypse'. Yes Rob someone actually managed to come up with a longer blog title than you. Hobby update - Tripod now available! Greetings all, welcome to the latest look into my hobby station - let's have a look at what progress I've been making in February shall we? Greetings all - it's a bit late this week thanks to the narrative battle report I published on Tuesday - what can I say, having written it I couldn't wait! This article returns to my series highlighting the other blogs on my reading list, this week the focus turns to A Guardsman's Guide to Glory. Funny Friday - watch out for those ones! 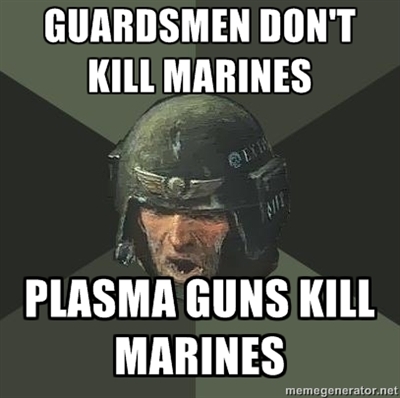 last time in my tactical article I looked at the space marine tactical squad. This time, it's the next of the 3 basic unit types that make up a battle company available to the marines, the devastator squad. Now you're going to have to bear with me here, because this might take a while, they have a lot of options! Way back last year I posted up about dipping my toe into the world of commission painting and in January I also showed off my first finished commission. With that success, and a couple of other projects taken on since then as well, I figured it was about time to launch the service properly. I will consider any commission. If you want something painting and you'd like me to do it then please get in touch! I am not a professional commission painter, this isn't my livelihood, it's something that I do to help support my own hobby, and I have my own painting that I will continue with alongside any commissions. As such, if you want me to paint you a 6000pt army in 3 months, the chances are I'll say no. If, however you want a few units adding to a force, or you're starting a new army and want to get an initial gaming collection on the table painted, then I'm happy to help out. I offer a painting service, and as such I don't offer to assemble the models for you. I will prime models if necessary, but that will be included in any quote. I will base models, my standard basing method is sand and 3 colour drybrush to colours requested. If basing is not required this will reduce the price, and more complex basing will increase the price, particularly if new materials are required. Please note, these figures are guideline prices, and may be both decreased as well as increased depending on the specifics of the models, the work required and any deadlines. Contact me at theburningeyeblog@gmail.com for a specific quote. Payment for postage to me and back to you is your responsibility, if you want to specify a particular type of service (ie signed for or tracked etc) then please specify this at the outset, otherwise I will include 1st class postage costs in my quote. If you want anything specific, please don't hesitate to ask, (lightning effects, flames, blended armour etc). If you know anyone who is looking for a commission painting service that doesn't cost the earth and will paint your miniatures to a good standard, please put them in touch - I'm more than happy to help you through your grey tide of unpainted plastic! well here it is - the first in a series of narrative games between myself and my good friend Ryan. The aim: create a string of narrative game reports, where missions and their outcomes lead naturally onto new games, side missions and outcomes. These are to be written up in a narrative style as well, from both points of view, rather than simply reporting on what happened and what the score was as the game progressed. As a side focus, Ryan and I have agreed to only use fully painted models for this series of reports, and we'll be including photos to really get down amongst the action and represent the game as it happened. Consequently you'll see fairly small forces taking part in the early stages of the campaign, and then as we increase the availability of units by getting them painted up you'll see the games expand. Hopefully we'll then manage to get a nice big apocalyptic conflict to end the series (though I have no idea yet when that end will be). Hopefully things in the games will remain narrative focused, and whilst we'll obviously both be trying to win, I'm hoping to see some nice cinematic moments in there too. I went with a fairly balanced force for the first mission, which we played to 1000pts. I had been hoping to find a recon mission somewhere, but in the end we decided to plump for the spoils of war maelstrom mission from the main rulebook to represent each force trying to gain intelligence on the other. The objectives would basically be narrative points to allow me to evolve the storyline. Ryan basically took what he had that was painted, though we both ended up finishing models the night before the game even so! The strategium of the Saint’s Retribution was a hive of activity. Sensorium crew were feverishly operating their instruments, utilising every piece of equipment, scrutinising every potential return to find the enemy. Servitors passed messages from the operators to the officer cadre clustered round the tactical plot in the centre of the room, the holographic projector showing a three dimensional image of the world below, slowly turning on the spot as the augers added tactical data to the projection. The thunderhawk Olav’s vengeance would be docking soon, and Chapter Master Regulo would require progress reports, updates on where the enemy forces had come from, and how their sensors had not detected them sooner. Sergeant Gonzalo had been left in nominal command of the Dusk Knight’s battle barge as the highest ranking Astartes on the ship, though the mundane operation of the vessel was under the control of Shipmaster Skeen. Gonzalo was a quiet, determined sort with an instinctive understanding of the tactical nuances of battle. Unusually for the Dusk Knights, this even extended to ship combat, and Captain Alvaro had no hesitation in recommending him to take command of the vessel in his absence alongside the Chapter Master. Immediately upon the identification of enemy units down on the surface, Gonzalo had launched the Olav’s vengeance to provide air support to the ground forces and effect retrieval if necessary. He was not about to become the officer who had been in charge when their Chapter Master was left unsupported under enemy fire. Even so, it had been a close run thing, the thunderhawk had not arrived on station until the skirmish had concluded, the Chaos forces disappearing into thin air as quickly as they had appeared. Gonzalo turned, and spoke to his second, Tono. ‘Acknowledged, Chapter Master.’ It was unusual for a recon team to include such heavy elements as Vasco’s thunderfire cannon and the venerable contemptor chassis of Ancient Sosimo, but Gonzalo concluded that the Chapter Master suspected further duplicity from the Alpha Legion - their modus operandi was always to conceal their true objective within schemes. Sergeant Gonzalo unclipped his war helm from his belt and placed it onto his head, the auto-seals clicking as the suit established the hermetic seal, cutting him off from the environment outside. With a thought, he energised the power fist he wore over his left gauntlet, the power field crackling as he flexed his fingers. ‘Shipmaster, you have the room.’ He said as he stalked through the door heading for the drop bay. By the time he reached it, Chapter Master Regulo would have resumed control of the bridge, and would command the operation from there, feeding all the tactical data from the sensoria down to Epistolary Valerio who would run the ground operations. Alpharius watched from the shadows of the ruined building. The foolish striplings of the Imperium had taken his bait without a second thought and he watched as the advance elements of their force prowled forward into the ruined city sector where he had concealed the warp device. Soon it would be time to strike, to throw off the shackles of shadow that had kept his legionaries concealed within the shattered buildings, and to strike once more at the ancient enemy. His task here on Golovin was simple, draw in the warriors of the Imperium and bleed them. Greater plans were afoot, but they required a sacrifice, and the greatest power was gained from those who walked willingly into such things, regardless of whether they actually realised they were a sacrifice or not. His vox link crackled, his warriors breaking radio silence for the first time since they had broken off the combat at station 19. Confident his subordinates would not risk his wrath unless it was absolutely necessary, he enabled the system with a thought, allowing his suit to receive the transmission. As he broke off, the first of the drop pods crashed to the ground, a small squad of dark blue armoured marines disembarking from it and moving into cover. As the stealth field of his force flickered out of existence, allowing them to move and engage, a squadron of landspeeders off to his right opened fire, the withering hail of fire peppering the hull of first squad’s Rhino, smoke beginning to pour from its engine compartment as his legionaries exited the vehicle. The Alpha Legion were nothing if not combat hardened however, they had been fighting the long war since before this chapter of marines even existed, and they were not to be cowed by a damaged transport. Taking cover amongst the wreckage, the squad opened fire in return, blazing plasma blasts from its special weapons and hard rounds from the bolters showering the advancing speeders, sending two to the ground in heaps of dented armour and broken gravitic repellers. Further off to his right he saw more plasma flashes, as second squad engaged the mobile artillery piece the astartes had brought with them. The cannon fell silent. “Come brothers,” he said to his guardian squad of terminator brethren “let us join this fight before it is over” and so saying, he engaged the circuits of the ancient mind veil wired into his suit, their forms shimmering as they crossed the field to the nearby squad of marines. “Emperor’s teeth!” cried Alarico, as he watched tactical display on his helmet update, the icons of Techmarine Vasco and two of the speeders from hurricane squadron flashing amber. As a squad sergeant he had access to the tactical net, updates provided by each marine’s armour systems on the health of their occupants in battlefield situations, and the Dusk Knights recon force had just lost a significant part of its firepower almost before they knew they had engaged the enemy. From the corner of his eye, he caught the glint of giant flashing armour, its pearlescent coating one second blue, the next green and all shades in between. Where had they come from? Terminators of the Alpha Legion, the massive armour plates were hardly easy to conceal and yet these figures had appeared as if from nowhere! They had no time, the giants were right on them, and even as he watched they struck, sending brothers Flavio and Odalis crashing to the ground over ten metres away. Alarico raged, and made to strike with his own combat blade, more in defiance than expectation, but before he could strike he felt a massive impact in his side, his armour splitting under the power of the blow. Ribs had cracked under the pressure, even his genehanced physiology and advanced armour systems unable to completely absorb the impact. He stumbled, and as he did so his head exploded with light, his vision fading as his sus-an membrane engaged to place him into a healing coma. No matter that he had been in the middle of the fight of his life - that life would be over without the restorative trance. Alpharius grimaced, as he sawed the chainfist through the main systems of the drop pod, causing it to sputter and die, the chattering storm bolter mounted in its roof falling silent. He turned and saw the enemy falling back from his brothers, three of their number already down, and the remaining two making best use of their greater mobility to retreat from his bodyguard. As they did so, one of the marines cracked off a shot with extraordinary skill, the round entering through the tiniest of gaps between the armour plates, detonating in a welter of blood and practically severing the leg of one of his squad. The giant figure crashed to the ground, out of the fight for now, though the wound was not fatal for an enhanced warrior such as the astartes. As he scanned the battlefield for sign of his next target, there was an earsplitting shriek of turbine engines. Fat bolts of ruby red laser fire streaked from the sky, accompanied by the whoosh of rockets and the chatter-whine of rotary cannons. In a pulsing fireball, second squad’s Rhino exploded, shattered armour plates spattering everyone in the vicinity, and the aircraft flashed past, gone in the blink of an eye, but arcing round for another pass. Engaging the mind veil once more, Alpharius advanced on the immovable form of the Contemptor dreadnought, ordering his squad to fire on the amalgam of machine and man as he did so. The underslung melta weapons attached to their bolters spoke, superheated blasts of air striking the dreadnought like a hammer. Armoured plates glowed then ran, the fingers of its powered fist becoming soft like clay as it swung at them, robbing the blows of their power. In return, Alpharius rammed his chainfist into the waist joint of the machine, shredding cabling and actuators, the wound an imitation of the one wrought on his bodyguard moments before. From behind him, autocannon fire chattered out into the brightening sky, as his havocs duelled with the Stormhawk Interceptor, but neither could find a definitive end to the conflict and the jets flared once more as the aircraft again banked around to come for another pass. At that moment, the second pod crashed down into the ruins of the city near second squad. The delay from the first pod landing had been no more than two minutes, but such a delay had given his force the time to run riot through the attacking forces, which were unable to coordinate their strikes as a result. The perfect Alpha Legion strategy, attacking in such a manner as to prevent the opponent from retaliating in any meaningful way. From the pod emerged the obvious leader of the enemy force, a librarian, his armour shedding waves of heat as flames licked from his fingertips. Fire from the emperor’s warriors engulfed second squad, the psychic flames joined by conventional promethium projectors and a strange, green flash from some arcane weapon he had never seen before. Whatever the green flashes hit, was destroyed utterly, 3 of his legionaries vapourising to almost nothing, their armour turning to ash in the wind. With that, he engaged the mind weil once more, he and his terminator squad leaving the battlefield, the ruined remains of the astartes strike force still mostly alive, but suffering. Their wounds would not be just physical, he considered, but psychological. They had come here confident of finding the enemy base, or at least traces of it, and they had been ambushed again, defeated with almost no effort and losses. The survivors would take the knowledge of this defeat back to their starship, and the dusk knights would become enraged by it. He had no doubt they would not feel trepidation about returning to the fight - ‘loyalist’ space marines feared nothing of the sort, even when a tactical retreat would be the more prudent solution. 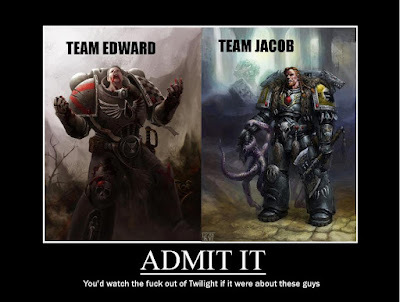 No, it wasn’t fear he sought, it was the clouding of judgement, so that they would become so infused with the desire to crush the Alpha Legion forces that they would become careless! Regulo looked through the armourglass window of the apothecarion at the recumbent form of Epistolary Valerio and the other injured the recon force had suffered at the hands of the Alpha Legion. It had been a high price to pay, certainly. Valerio would not fight again for weeks, and Sergeant Alarico had also suffered serious injury, whilst hurricane squadron and Ancient Sosimo were already undergoing significant repairs in the armorium decks of the Saint’s Retribution. He had what he had intended however, the recon strike force had never been meant to strike a blow against the Alpha Legion directly, but dispatching a lesser force would have given them away. Specialist Vasco had never been meant to act as artillery support for a recon mission, such a weapon was not suited to the nature of the mission, and it had been a boon that the enemy had targeted the cannon early. The brother had been able to disappear under the cover of the bright plasma flares crashing into his cover, shedding his servo harness and engaging his own stealth field as he did so. He had returned to the battle barge bearing precious gifts indeed, having infiltrated the corrupted machine spirit of the rhino armoured personnel carrier that hurricane squadron had disabled, he had been able to track the progress of the machine, its emissions allowing the sensors on the Saint’s Retribution to follow the path of the vehicle back to its origin point on the planet, deep in the heart of the city. They had it now, the actual location of the Alpha Legion base, and he would not be merciful in his vengeance, he would strike back at these traitors and make them pay for Valerio’s pain with their blood. Ryan: What a game, the alpha legion managed to complete their goal of infiltrating Nick's house and replacing his dice with dice that can only roll ones and twos. I decided to start everything on the board for this game, knowing at small points games like this I would need all my models in play either being bullet magnets, grabbing objectives or killing the unclean filth of the Emperor. With Nick's force coming on piece meal it gave me board control and weight of fire, so the victory was down to poor reserve rolls and by no skill of mine :) (well, maybe a little skill - Nick). 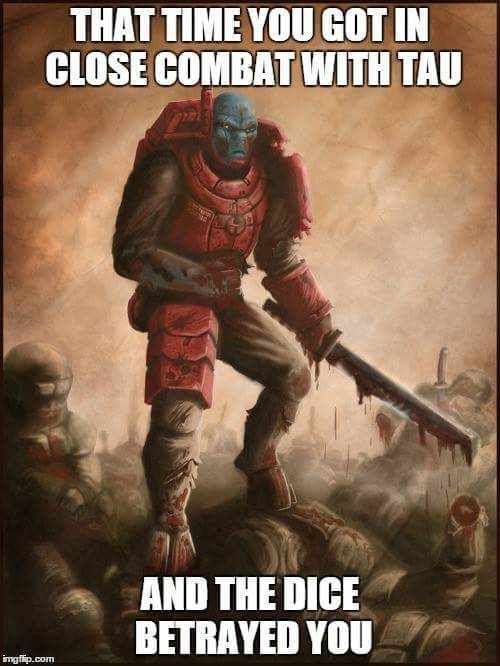 My mvp's would be the basic chaos marine squads they really carried their weight in this game. A special mention must go out to my terminators for actually killing stuff and not failing their first few saves. Being an extremely expensive unit in the chaos codex, they can be really hit and miss. Only Nick's force did the missing in this game however. Until next time. Hydra dominatus. Nick: What a game indeed. Ryan is probably the best player I come up against with any regularity and it shows in the way he plays and thinks - I figured having air superiority would be a good thing in a small game like this and that my flyer would be able to rule the skies. Due to me not having finished pod 3 however I could only guarantee one of my tactical squads in the first turn, and with the objective cards I drew, it seemed to make sense to sacrifice the smaller squad to claim the objective in the centre of the table that was within reach of the terminators - if I hadn't done that then Ryan would have been stealing my objectives on his turn 1. As it happened, my warlord then managed to fail both his reserve rolls, not arriving until turn 4 and with 377pts off the table in a 1000pt game, that was a massive issue for me. As Ryan said, my dice then continued to betray me with my contemptor failing to cause a wound in combat with the terminators after being prevented from moving off the objective he was deployed on because I kept drawing it to claim. Inevitably he didn't survive the return attacks after taking a couple of melta shots before they charged. I fully anticipated my libby arriving would at least swing things a little my way, but after having his flame breath power denied, he failed to manifest force in the following turn, then missed with all three of his AP3 attacks in a challenge against the power fist wielding Alpha Legion sergeant - even a single wound would have killed him and gained me at least one more victory point! I really don't want to whinge about my dice though - Ryan played the perfect game and I made mistakes. Hurricane squadron made mincemeat out of one of the Rhinos in the centre of the table forcing the squad to disembark, but by then I had already fired my thunderfire elsewhere, and the tightly bunched up unit would have been a perfect target! I also foolishly deployed the thunderfire in such a position that the techmarine wasn't in cover, so as to allow him to hold a nearby objective if necessary. That of course meant the two plasma guns in the other chaos marine squad had an ideal target on turn 1 and they made the most of it - all four shots hitting and wounding. To be honest, I'd struggle to name a unit that qualifies for an mvp, I was beaten that resoundingly. However, one moment does stand out - when brother Apolinar, having recovered after falling back the previous turn (I love ATSKNF) rallied to put a bolt shell straight through the armour of the advancing terminators. Leon next to him was so shocked that his melta shot missed entirely. Hobby update - February off to a cracking start! Greetings all - welcome once more to the inner workings of the burning eye's painting station! This week we have some finished projects that spilled over from January (which really does mean I'm off to a flyer in terms of productivity, 6 models finished within 2 days of the month starting), and then some commissions I'm working on. 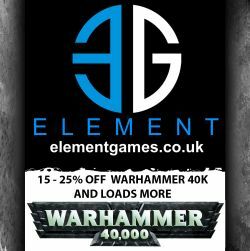 40k - the road to competence - first two games. following on from my initial article on the subject, I thought I'd follow up and update you all on how those games went. These aren't battle reports, but a look back at the tactical choices and abilities of the units I took, and their performance in the game. Funny Friday - in the grim dark, you have no friends. Well, I said back in January that I might see about resurrecting 'the adept', and a certain executive at a certain charity provided the perfect opportunity for his return. Funny Friday is back, and the second Adept article is imminent. I've also included some new regulars, such as the spotlight on blogging and the 40k road to competence. Well when I wrote this aim, I never expected to hit over 20k views in month 1! I comfortably beat it too, with 24,154 views in January, I'm sure partly thanks to the high post output, so hopefully I can keep that going and views will increase as the readership becomes more widespread. The first of these games is pencilled in for this week, so expect to see a report sometime soon! I've tried to take pictures where possible of my finished units using better backgrounds etc this year, though perhaps I'll also look at doing a monthly roundup of the models I've finished within that time, what do you guys think, would you like to see a monthly shot of all the stuff I've finished? Not yet, probably give it a few months. You could say I achieved this one! I'm only counting stuff I finished in the month, so there will be models that get largely done one month that are counted in the next, but this month's total (including commissioned units) is over 600pts (621 to be exact). Well I now have enough models to put this formation on the table. None of them are painted, but that's still progress though eh? Haven't touched the purple paint for ages, though in a surprise message I did manage to get my Eidolon included in Forgeworld's Instagram gallery (despite it still technically being a WiP) so that was a good day! Not going to happen for a while, unless thinking about it inspires me to do some work on it! I have a loaned airbrush with compressor, though it's very much an intro kit. I have some air paint to use with it. Now I just need some courage to actually give it a go! Well I lost our first 40k game, then beat him at bloodbowl, though I'm only really keeping track of the 40k games, so I need to win that narrative on Thursday to even things up! 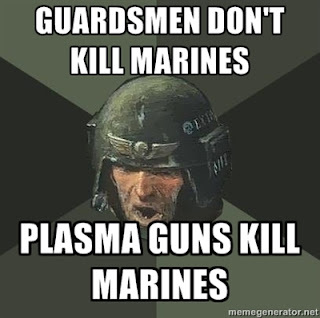 At least he's not using the Tango Marines! Currently their yearly win rate stands at 67% from three games. And that's using fairly basic lists at low points, so hopefully that's a good basis for improving at higher levels. Haven't used the Tau yet this year. It's still fairly early days, though an appalling casualty record (ie if I hadn't had an apothecary, my team would have lost somewhere in the region of 6 players so far) meant I had a few dodgy games. Last match out was a win though, so hopefully the corner has been turned (don't jinx the yeti by mentioning him). See my 40k road to competence series for real progress on this, though I have some theories for successful competitive lists that I'm working on building. My two wins this year have both been built around a basic core of the army though, so whilst it's early days, and I've only played small games, I am at least making progress in this regard. I didn't attend any tournaments in January. February might have seen one, but unfortunately Dave's birthday bash also clashes with my wife's birthday so I figured if I wanted to stay out of the dog house it was sensible to celebrate that instead (sorry Dave!). Weight:fluctuating daily, but at the start of my weigh-ins just after the start of the month, I weighed 104.3kg. I'm now (as of 31st January) 100.1kg so a total loss of 4.2kg. I'm really pleased with this, I'm told it's already visible in terms of a thinner neck/smaller stomach and apparently my snoring is improving, so that's all heading in the right direction, now I just need to back it up this month and keep going! So, overall I think a very successful January. I've not actually added up the percentage of objectives achieved, but writing this post it feels like it's more than half, certainly of the ones that I can achieve on a monthly basis. Is there anything you guys would like to see from the blog? More tactics thoughts? Battle reports? Painting showcases and explanations? Let me know in the comments below, I'm here to serve!